Vendors who used to do business in this market had been shifted to other temporary and scattered markets within Arua Town to pave way for the construction of the modern market. Arua — At least 4,600 vendors in Arua Municipality will have space to do business in the new Arua main market currently under construction, the project manager, Ms Viola Bacia, has said. "The estimated capacity of this market will be 4,600 vendors and it takes care of all the vendors who were previously here and even more. During the needs assessment, the number of vendors was about 4,092 but given the timeline of the project, we had to project an increase in the number of vendors. During this period of construction, definitely there are very many people who are going to join the same businesses of selling things in the market," Ms Bacia said. Construction of Arua Municipality Central Market started in February 2018 and works are expected to be completed by February next year. Vendors who used to do business in this market have been shifted to other temporary and scattered markets within Arua Town to pave way for the construction of the modern market. The relocation of the vendors has greatly affected their businesses since some of them can no longer link up with former customers. Despite assurance of priority for space for the previous vendors, some of them expressed pessimism over chances to get space in the new market. 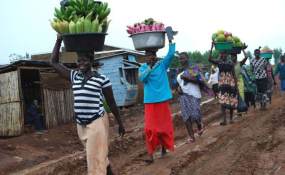 However, Ms Margaret Safi, the mobiliser for Arua Market Vendors Association, said: "Some of us may not have the opportunity to get space in this new market. The spaces will be highly competitive. We are not hopeful of our fate to get stalls in the new market." Mr Joel Aita, the chief executive officer of Joadah Consult, the company that oversees the construction of this market, said: "We had some delays at the beginning due to a lot of rain. Sometimes we would dig a foundation and the following day it rains and all the column bases are filled up with water. But we have managed to catch up (with work schedule). Actually, our target is that by April this year, all the concrete work should have been completed and then we start doing roofing, block works and fittings. And then from May, we start with finishes. Right now we have done 23 per cent of the work and I am optimistic that by February 2020, we would be able to hand over this project."